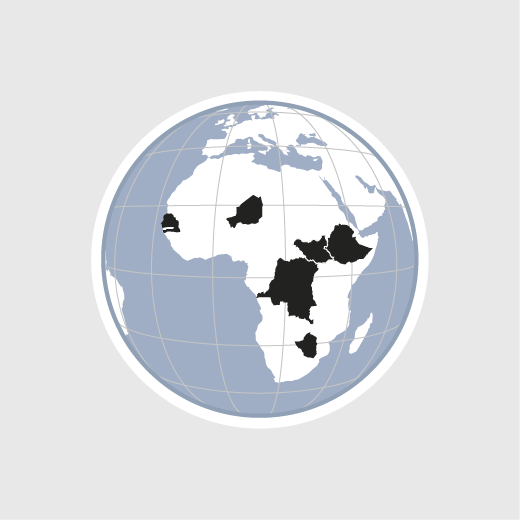 HEKS/EPER operates in six countries in Africa: Democratic Republic of the Congo, Ethiopia, Niger, Senegal, South Sudan and Zimbabwe. Rural community development is central to its commitment. HEKS/EPER supports smallholder families in building better, more stable livelihoods through improved access to drinking water and land, natural resource preservation, the use of organic farming methods and through disaster preparedness measures. Smallholder families enhance their food security, diversify their income streams and are better protected against drought and flooding. In times of acute famine HEKS/EPER and its local partner organizations provide humanitarian aid. HEKS/EPER also promotes prevention and conflict resolution in tense situations. HEKS/EPER supports the rural population in the Maradi and Zinder regions in building up profitable and sustainable agricultural production and in livestock farming. HEKS/EPER supports people in Senegal in securing access to land, in sustainably managing natural resources and in tapping new sources of income. HEKS/EPER supports some 55 000 people in rural Ethiopia in gaining access to drinking water and land and in protecting against drought and flooding. Poverty and violence are widespread in the DRC. HEKS/EPER is enhancing the social and economic conditions of rural communities in North Kivu Province. HEKS/EPER is improving the living conditions of people in Zimbabwe's Matebeleland South Province through rural community development and peacebuilding projects.